1. Pin basting a quilt is important. Don't take the pins out just because you think you are far enough along and you're tired of taking safety pins out. It will screw things up. There's one part of the quilt that is messed up because of it, but I was so focused on finishing it that I chose to overlook the mistake. 2. I need a decent sewing machine. My sewing machine is not capable of creating a quilt without completely frustrating me. 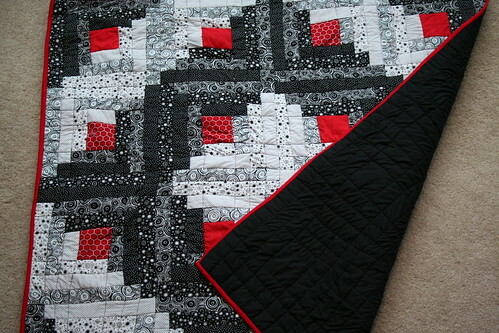 A lot of the delay in completing the quilt was due to fighting with my sewing machine. ETA – It's a good machine, just not intended to be used as much as I have used it lately. It's lasted longer than I thought and I've determined that I'm going to be able to use a sewing machine, so it's served it's purpose. I am shopping…any ideas? 3. Piecing matters. 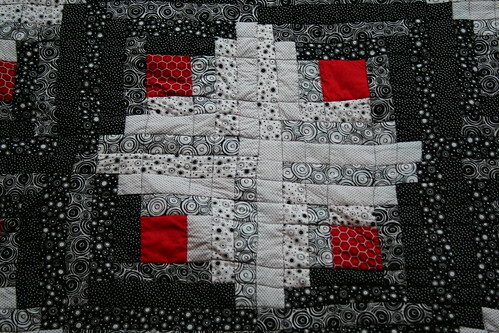 Don't overlook the little mistakes because they can become big mistakes when you start sewing the quilt together. 4. Hand-stitching the binding takes a long time, but it's not as bad as I thought it would be. Carolyn is right, that's when your quilt starts really looking like a quilt. I got faster as I went along. 5. I can carry out my own ideas while quilting. I used a little tutorial where I saw the diamond pattern and the colors that were going to be used in the baby's nursery to come up with this quilt's layout. While I realize it's hardly original, the other two quilts I've started (um, but never finished) were straight from a book. 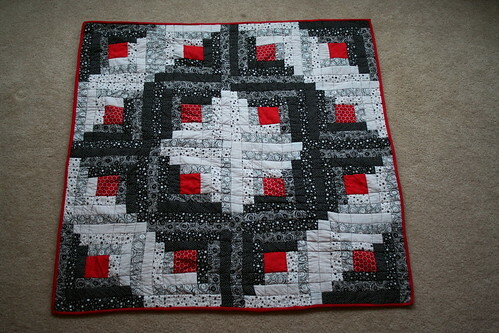 It was fun to develop the quilt on my own. dude, it looks awesome. i think black/red/white log cabins are soooo visually arresting. and very classy. i love the fabrics you picked. congratulations on an awesome awesome first finish. yippee!!! WOW! That is fantastic! I love it – you’ve done an amazing job! Congratulations!!! It looks amazing — I am in awe that this is your first quilt! WOW. I seriously cannot believe this is your first quilt – it’s amazingly beautiful, Sarah. You rocked this!! I’m inspired! ooooh, it’s gorgeous sarah! i love it!